Oh wait... It's Alaska Governor Palin! She's the one who ran for V.P against six major Dem. Media outlets, a comedy network, & most of European Media. By the way: How's the "52 days" working for you all? 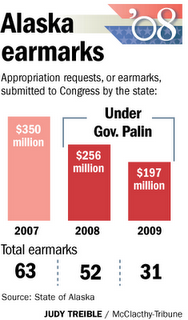 And yes, let's not look at the trillions of SIGNED earmarks, designed to stimulate a furthering (Dem 2012) Government; let's blame (R) Governors for accepting it... ACE has more: also. IRONY: "Hypocrisy watch" is showing its own "Hypocrisy watch!" "The governor never said that earmarks should be abolished or that the State of Alaska wouldn’t seek or accept any. Didn’t happen. What she said well before she was a national candidate (going back at least to October of 2007) was that earmark reform was necessary and the state would need to rely less on federal money than it had been." Image: ht- C4palin Read more. For the next year’s budget, Gov. Palin will only make eight requests, totaling $69 million, which will include "six ongoing federal appropriations and just two new projects: an upgrade at the Kodiak Missile Defense Facility, which is relevant to national security, and a bridge replacement critical to construction of the pending Alaska natural gas pipeline, also in the national interest." more. ADVICE TO THE PRESS: Give Us The News, or Go Away. WASHINGTON POST: Obama’s New Tack: Blaming Bush. Hope and Change and it’s not my fault! But Bush didn’t make him spend a trillion dollars on partisan pork, or spook the markets with destructive talk and policies.